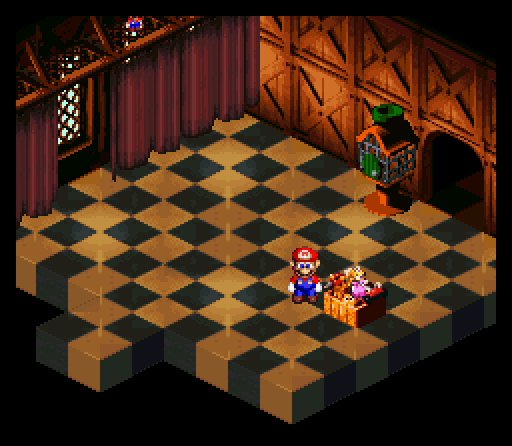 Peach is kidnapped by Bowser so Mario heads to Koopa's Keep to save her. 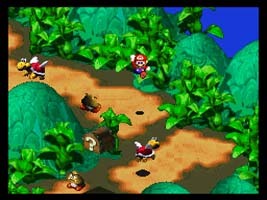 During the battle, a giant sword crashes through the Star Road and into Koopa's Keep, scattering Mario, Bowser and Peach across the Mushroom Kingdom. An invading army are trying to gather the pieces of the Star Road to take over the land. Mario must team up with old and new friends, including Mallow, Geno, Peach and Bowser. Together they vow to gather the pieces themselves and stop the invasion. Battle through enemies and complete quests as you travel the Mushroom Kingdom. Earn experience to power up Mario and friends. 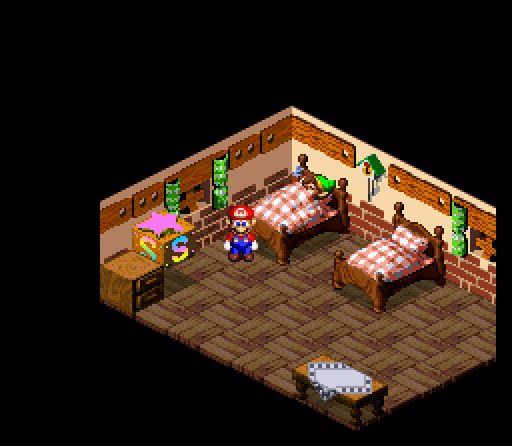 Sleep at the Rose Town Inn as soon as you arrive in Rose Town for the first time. When you wake up, the second bed will be occupied by Link from The Legend of Zelda series. If you talk to him, you hear The Legend of Zelda "discovery" fanfare. When you reach Land's End for the first time, instead of completing it, head all the way back to the Mushroom Kingdom and sleep in the Castle's guest room. When you wake up, head to Princess Toadstool's room and check the bed. 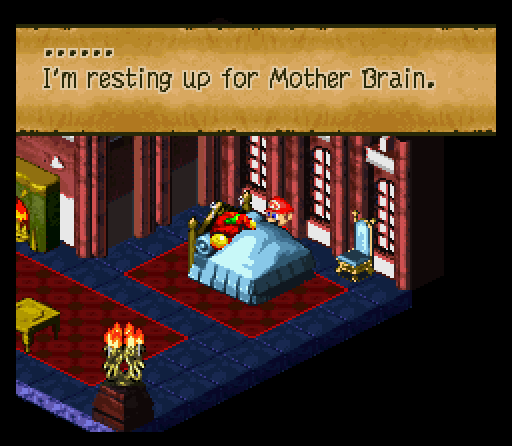 Samus Aran from the Metroid series is sleeping in the bed, resting before her battle against Mother Brain. Reach the top of Booster's Tower and you will find a toybox full of dolls. Aside from the dolls that Booster plays with, there are other dolls in the box, including Samus Aran from the Metroid series and Diskun, the mascot for the Famicom Disk System. Other objects in the toybox may be references as well. Head to the rightmost corner of Hinopio's Inn inside Barrel Volcano. 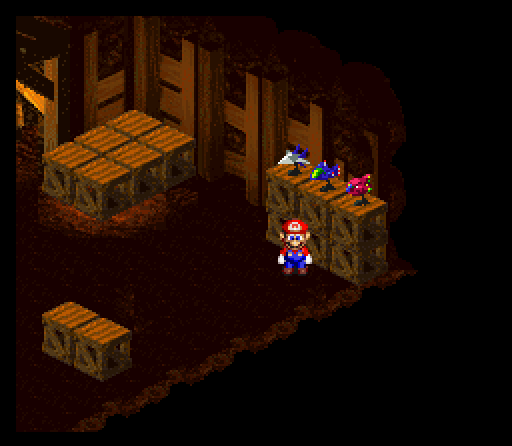 On top of some crates are three models of futuristic spaceships from other Nintendo games: The Arwing from Star Fox and the Blue Falcon and Fire Stingray racers from F-Zero. Because the game is an RPG developed by Square, it features a number of references to the Final Fantasy RPG series. Monstro Town is home to a locked door that cannot be opened without a special item known as the Shiny Stone. Behind it is the hardest battle in the game with a terrible demon known as Culex, and his four elemental Crystals of Earth, Wind, Fire and Water. Culex is based on the boss battles from Square's Final Fantasy series of RPGs and the crystals also appeared in a number of Final Fantasy games. The music and victory themes during the battle are taken from Final Fantasy IV. 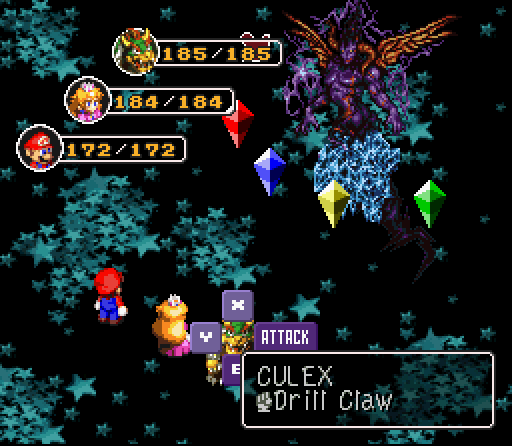 Contrary to popular opinion, Culex is an original creation for Super Mario RPG. He is not a character from a Final Fantasy game, but has been designed to look like a number of boss characters from throughout the Final Fantasy series. One of the most powerful summons in the Final Fantasy games calls out Bahamut, the Dragon King. 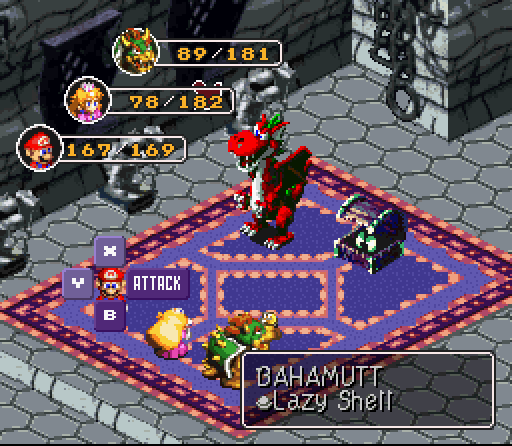 In Super Mario RPG, one of the dragon enemies is named Bahamutt. In Final Fantasy VI, the leader of the Eight Dragons was named Czar Dragon (Kaisaa Dragon in Japan), and while its game data is still in the game code, it isn't possible to fight it during normal gameplay. In Super Mario RPG, you fight a boss in Barrel Volcano named the Czar Dragon, who resembles a Blargg enemy from Super Mario World, a reference to this lost boss battle. After beating its first form, it transforms into a skeleton dragon named Zombone, which was also the U.S. name of the Zombie Dragon in the SNES version of Final Fantasy VI. 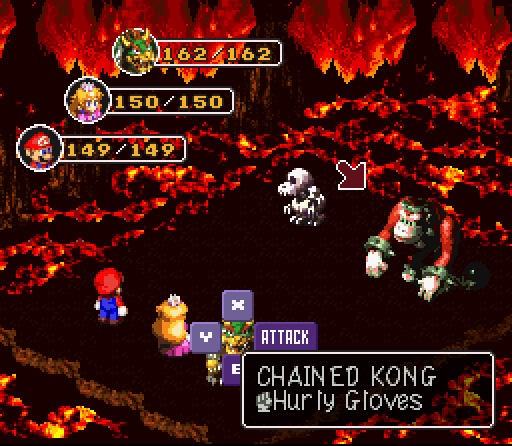 The enemies Guerilla and Chained Kong are based on the CGI model of Donkey Kong from Donkey Kong Country. In Japan, their names are "Donkey Yung" and "Barrel Kong" respectively. "Don't confuse me for someone else!" One of the seven trials at the end of the game requires you to climb up a castle wall while a Chained Kong throws barrels at you, which you have to avoid. This is a reference to the original arcade Donkey Kong.